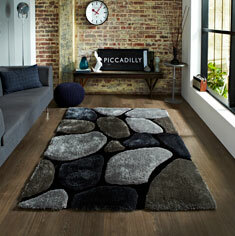 Noble House rugs, one of our best selling contemporary textured ranges, this is down to design, colour and affordability. Noble house rugs are constantly being revamped to keep up with changing interior fashions and trends. All rugs in this range are hand tufted in China using 100% high density acrylic yarn, each rug has a multi-texture pile, this gives a thick textured look and feel.